After a number of conversations recently with retailers and payments providers it’s become glaringly apparent that fintech will re-write the payments landscape, both in terms of how, when and where payments are made and in terms of who is now handling the payment. There is no doubt that fintech is already making massive inroads into the consumer retail space and given the pace of change no-one involved in the industry can any longer afford to take a “wait and see” approach. It is imperative to keep up to date with the developments which will really drive change – from mobile wallets to the blockchain – as well as to seek partnerships with the innovative new players in the game. This is just one of the many topics we’ll be discussing at the All Payments Expo in New Orleans in March. I’m looking forward to opening up the floor and hearing what everyone has to say! The early-bird rates to attend the 2016 All Payments Expo are expiring this Friday, November 20th. Save $900 when you use the code XU2948BLOG – Register now. Gifting Expo: The latest strategic thinking, technologies and innovations impacting the gift card industry. Prepaid Expo: Converging business leaders in prepaid to drive industry growth. 2. More Merchants Than Ever Before. With more retail-focused content than before, you will get access to the following retail job functions: Head of Marketing | Head of Payments | Head of IT | Head of OmniChannel | Head of eCommerce | Head of (Product) Innovation | Head of Loss Prevention (LP) | Gift Card Manager | Head of Digital Marketing | Head of POS | Head of Security and more. 3. 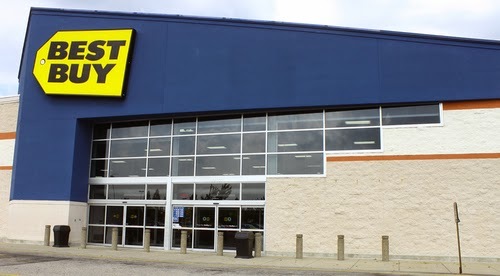 Where Business Gets Done. For more information, download the agenda. We look forward to seeing you at the Hyatt Regency in New Orleans, March 20-23, 2016. APEX is our flagship annual payments event which attracts 850+ senior executives from across the retailer and payments communities. It is a highly interactive forum in which to discuss the rapidly evolving world of retail payments - from macro industry trends to digital convergence and payments disruption. By bringing together the brightest minds and leading talents in retailing, payments and technology it is a truly compelling event with unprecedented networking opportunities. We have created an outstanding program for APEX 2016 and we are seeking new speaking talent to bring the very best ideas in payments to our expert audience. We would welcome speaker submissions from cutting edge retailers, banks, merchant acquirers, POS providers, technology companies, program managers, processors, networks, card manufacturers, and service providers. After an exciting panel discussion in the Program Managers Workshop at APEX 2015, titled "Building New Markets, New Business and New Marketing Power in the Prepaid World", Moderator Omri Dahan of Marqeta, Andrew Siden of NexisCard/Prepaid Ventures, and Patrice Peyret of Banking Up joined us to discuss the future of prepaid, prepaid as a vehicle for the affluent, the biggest untapped opportunities in prepaid, as well as the biggest challenges for the industry. See what these industry experts had to say about each below. At All Payments Expo, Mark Romanelli of Giftcards.com moderated a panel session consisting of Drew Hyatt of Kofax and Mark Putman of First Data on getting the most of your gift card program. After this exciting session, the panel joined the APEX team for a Q&A session. Stay updated on APEX 2016, March 21-23 in New Orleans - Check out the website. The word cloud above is a visual representation of the state of the payments industry according to the All Payments Expo Executive Summary. To download the full report, click here. APEX is the annual meeting place at the intersection of payments innovation, including emerging payments, prepaid, alternative financial services, retail and technology. Join us March 21-23, 2016 in New Orleans for All Payments Expo 2016! At All Payments Expo 2015, Ryan Craver of Lamour moderated a panel titled "Retail Technology: How Mobile is Changing Everything", the panel consisted of Ken Bott of Darden Restaurants, Tom Neri of GfK Custom Research North America and Len Dudis of SeaWorld. Consumer data analysis - What is possible? 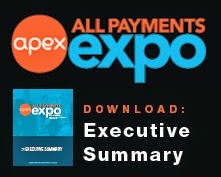 The above infographic was created from the All Payments Expo 2015: Executive Summary - To download the complete summary, click here. All Payments Expo is the annual meeting place at the intersection of payments innovation, including emerging payments, prepaid, alternative financial services, retail and technology. Join us March 21-23, 2016 in New Orleans for APEX 2016! The dog days of summer are here, there is no denying it. Are you looking for that next summer read to get your mind off the heat? Then take a look back at the wealth of knowledge that was to be had at APEX 2015 by re-reading the Executive Summary. There is no better time than now to refresh yourself on what was discussed. This exclusive report features key insights and analysis from APEX, along with detailed coverage of specific presentations and panels from the conference. The future of payments will be device, platform and location-agnostic. Retailers are scrambling to wrap their brains around the options, but the nature of POS transactions will most definitely change dramatically in just the next couple of years as mobile technologies bundle POS, marketing, shopping, customer engagement and data collection seamlessly. Cryptocurrencies may reach an adoption tipping point sooner than expected and with a profound impact on multiple financial service categories and industries, most notably by driving a low-to-no-cost peer-to-peer payments revolution. Competition to capture the patronage of the massive un- and under-banked populations of the world (including those in wealthy First World markets) will occupy the attention of established players and start-ups alike as technology knocks down barriers to access. Download the executive summary now to learn more and see what the buzz was about. London - May 18th, 2015 - Leading global payments processor Global Processing Services (GPS) today announced that Suresh Vaghjiani will be joining their Senior Management team as Executive Vice President of Card Services. Suresh commented, "We have all witnessed the growth of GPS globally in recent years and it is certainly exciting to be part of the team tasked with continuing the expansion of our global footprint". In his former role as Director of Issuing at Optimal Payments PLC, Suresh successfully established the Issuing and newly formed Card Services division. Previously, as a founding member of Kalixa Payments Group, in his role as Head of Kalixa Pay, Suresh launched the award winning Kalixa prepaid card across international markets. Suresh has a substantial understanding of electronic money, throughout its complete value chain from Issuing to Acquiring, with strategic knowledge on what works and does not work in various international markets. As a member of the UK Contactless Advisory Committee, Suresh worked with TFL to pilot some of the first contactless prepaid products used on the London transport network. In 2011, Suresh launched the first ever contactless wristwatch in the UK. This is in addition to being responsible for launching the first App controlled NFC solution for i-phone in Europe. Suresh is an elected Advisory Board member for the Emerging Payments Association. GPS was founded in 2007 by the owners of Flex-e-vouchers (FEV). FEV was one of the pioneers of prepaid Programme Management in Europe and continues to operate successfully today. FEV's founders identified weaknesses in prepaid processor capability and decided to launch a second business (GPS) that would provide the flexibility needed to service prepaid Programme Managers worldwide. GPS is a MasterCard, Visa Inc. and Visa Europe accredited processor. The platform was built in-house from the ground up and is tailored to prepaid card functionality, utilising the multi-year experience gained from operating one of the largest programme management companies in Europe. Neil Weeks, Chief Commercial Officer at GPS commented, "Suresh is a well-known and respected industry expert. We are delighted to announce his appointment to our senior management team". Tony Kerr, Chief Executive Officer at GPS added, "Suresh has a depth of product and industry knowledge that is amongst the finest in our sector. We believe that Suresh will strengthen our executive team, further underpinning our global rollout strategy". Will security hamper the future of payment technology? Innovators in the payments world are seeking to decrease dependency on cash payments by increasing development in the payment technology world. 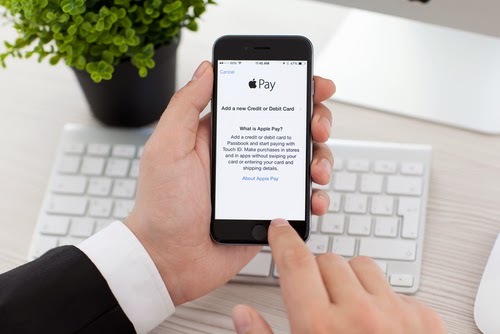 However recent studies have shown that general acceptance of new payment technology has its drawbacks as security has been found to be an issue for potential customers who are starting to use new payment systems. 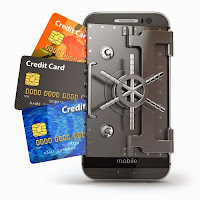 A new study carried out by the Ponemon Institute has found that consumer demands, that have put pressure on the development of payment systems, has caused anxiety about security. However it is due to this demand from the customers who could have their security compromised, that has prompted this rush to develop new technology. 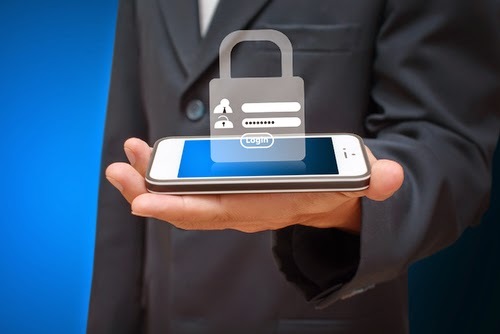 Out of the 748 security, I.T., risk management, product development and other payment based professionals who are all based in the U.S., almost 70% thought this pressure to adopt new convenient systems could threaten the security of customers. A quite worrying 53% of those surveyed stated that they’d rather better customer convenience than security. This in my opinion is made worse by the fact that 47% of respondents stated their organisations ability to deal with any potential risks were ‘not effective’ or ‘somewhat effective’. In terms of where the risks are mostly likely to be there was quite a clear split – 34% responding that they believed online purchases were the greatest risk, 25% arguing point-of-sale devices and 24% suggesting mobile payments were the biggest risk. The survey also delved into who the respondents thought are responsible for payment security and the results were slightly limited. From those who took the survey, 45% believed banking institutions were responsible, credit card companies were chosen by 40% and 33% argued that the regulators should be held responsible. In comparison with the results for who should be responsible for protecting customer data following a breach, 75% believed the company who lost it should be held accountable and 69% for the bank who issued the cards affected. Despite these apparent risks, money is still flowing into payment technology, though with caution. Almost 56% of payments players said that they predict their investments will increase over the next 18-24 months; only 12% expected a decrease. In terms of development for the payment technology industry as a whole, there is a general consensus that greater collaboration is needed across the board. There are too many who could miss out due to each individual payments technology player concentrating on their own niche product within the industry. Moving forward there is a call for a decrease in middle men within the field to simplify the chain of global payments. Along with this, greater collaboration between companies is needed in order to iron out important issues such as security that could be a huge problem for future users. 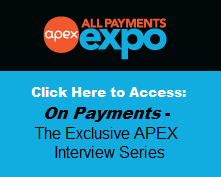 More than 800 professionals with a stake in the payments ecosystem converged on Las Vegas, NV this year for APEX 2015—the All Payments Expo—to network and get up to speed on the latest in payments innovation and developments in prepaid, alternative financial services, retail and technology. We on the APEX team are now pleased to present the official 2015 executive summary, an exclusive report featuring key insights and analysis from APEX, along with detailed coverage of specific presentations and panels from the conference. › The future of payments will be device, platform and location-agnostic. 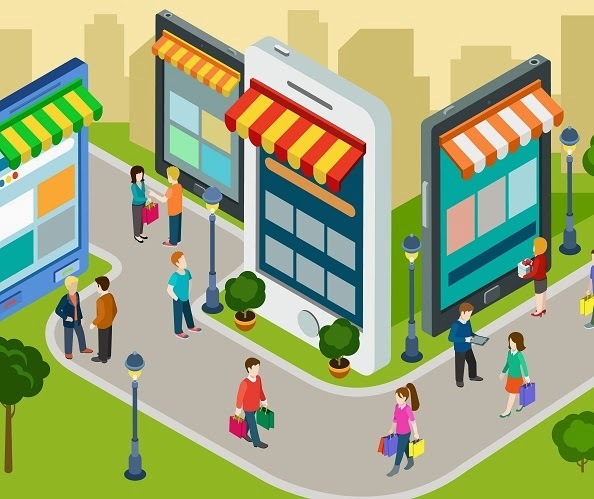 Retailers are scrambling to wrap their brains around the options, but the nature of POS transactions will most definitely change dramatically in just the next couple of years as mobile technologies bundle POS, marketing, shopping, customer engagement and data collection seamlessly. › Cryptocurrencies may reach an adoption tipping point sooner than expected and with a profound impact on multiple financial service categories and industries, most notably by driving a low-to-no-cost peer-to-peer payments revolution. › Competition to capture the patronage of the massive un- and under-banked populations of the world (including those in wealthy First World markets) will occupy the attention of established players and start-ups alike as technology knocks down barriers to access. The saying goes, “What happens in Vegas, stays in Vegas.” Luckily that does not hold true for APEX 2015! Download the executive summary now to learn more and see what the buzz was about. Bitcoins have often been in the news for a number of reasons and many times in a negative light. Bitcoins were strongly related to the website Silk Road which was an online ‘deep web’ black market space that sold illegal drugs, firearms, assassinations and more. However bitcoins have the potential to be a useful form of currency as we move into an age where many are predicting the decline in need for physical cash payments and a move toward contactless payment technology. Bitcoins are not tied to countries or regulations and are useful for international payments. They are easily transferable and can be kept anonymous which is why there has been doubts due to usage in illegal activity. Coinzone, a Europe-based payment solution provider have recently announced that they will launch a new bitcoin wallet that will support currencies across Europe. The announcement signals the move toward embracing bitcoins as a more mainstream form of currency. Coinzone’s new wallet has been developed in order to address legal and privacy frameworks in operation across Europe. Manuel Heilmann, who is the CEO and co-founder, told CNN “The Coinzone Wallet will be unique for a number of reasons, both at launch and also looking ahead to the future,”. The new wallet will be available for users wherever they have a web browser. 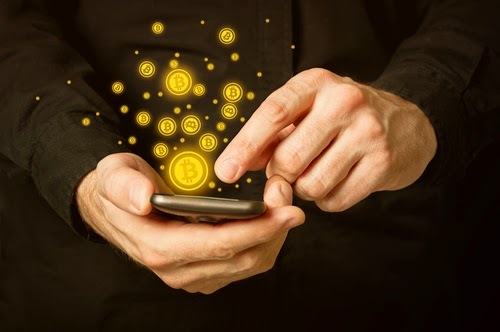 This means that iOS and Android users will be able to manage and authorise bitcoin transactions whilst on the move. Heilmann goes on to say “For launch, our goal is to make it very easy to spend bitcoin. It’s a simple yet very crucial feature that is either missing or not easy to use in other wallets.”. According to Heilmann the top five most active countries on the Coinzone platform are Germany, France,Spain, Romania and Italy. The initiative has also been launched now in the U.K. and the Czech Republic where growth is increasing. The wallet is available to very diverse range of countries with customer service initially aiming to support English 24/7, German, French, Spanish and Romanian and aim to respond around the clock. When it comes to bitcoins, customers cannot afford to wait until the next day when purchasing or selling. Coinzone has a broad and comprehensive understanding of the European regulatory landscape. Users of the wallet will be under European privacy laws that means data is securely hosted in European data center locations. Heilmann believes the wallet will give users a hassle free experience that allows them to “transact with confidence” and to utilise “the local language, currency and payment instruments that are relevant to where they live.”. This announcement signals the constant development in the payments world that seeks to create easier payment transactions for businesses and consumers alike. Creating secure and dependable systems for bitcoins can take the stigma away from the negative connotations that arose from Silk Road. In just a few short weeks, 200+ payments and retail executives are heading to Marbella for All Payments Expo Europe. This is Europe's only devoted retail & payments business development meeting, where the prepaid and retail value chain host meetings, create new partnerships and explore synergies. Contextual commerce's impact on conversion and more! Join an international community and get face time with the peers and partners you need. Register today to secure your spot - PLUS save €100 when you use the code XU2940BLOG. 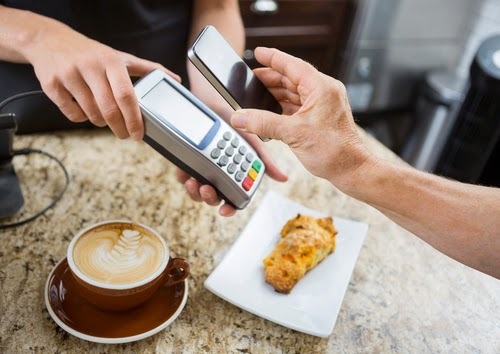 A recent announcement in the prepaid payment technology world was that ICICI Bank, India’s largest private sector bank, have collaborated with Tech Mahindra Limited, to launch a contactless payment service that is based on the Near Field Communications (NFC) technology. This innovative new payment service which has been named ‘Tap n Pay’ will allow anyone, including non-ICICI Bank account holders to make over the counter purchases, reducing dependency on cash. The customer will be able to use their NFC enabled mobile phone at the merchant’s point of sale device to make payments. The new innovation is a pre-paid account that allows customers from any bank to register for it and can transfer money online from any account. Customers are also able to top up their ‘Tap n Pay’ accounts by sending an SMS. Tech Mahindra managing director and chief executive CP Gurnani stated that “The synergies between the two partners (ICICI Bank and Tech Mahindra) will bring about a new payments ecosystem, parallel to, and yet in harmony with, the existing payment networks in the country,". The service is currently a closed end service and not a universal payment method. The announcement stated that at the moment the new technology is only for large campuses at corporate offices. For example being used at canteens or to buy meal coupons. To me this is advantageous using it less as a universal card but for certain purposes at the start and then maybe expanding. An issue that can come around with universal tap like payment systems can be unwittingly paying for things you didn’t want to. This was a problem in London, England. The London Underground has a barrier system were the majority of users swipe their Oyster card which has a set amount on, to get through. However, people often kept the Oyster card in their wallet to swipe and their wallet often already had a tap payment card; this meant that money would sometimes be debited off that card whilst trying to swipe through the barriers. This became a serious problem and announcements were having to be made on the Tannoy public speaker systems to warn customers. This announcement shows the ongoing advances being made in the prepaid payments industry that seeks to increase payment efficiency and to many, signals the lack of need for physical cash. The increase in these types of innovation, many also believe could mean a lack of dependency in banks. Banks will have to come up with innovations of their own to help keep up with the changing times. Omnichannel retail strategies have been much on the thoughts of retailers over the last couple of years because of an increased focus on ‘social shopping’. 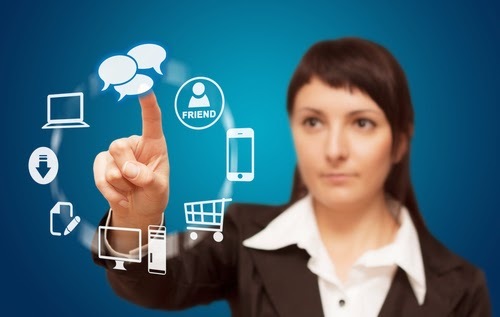 Omnichannel strategies aim to create a seamless consumer experience across different platforms. One of the platforms that is being utilised more often is social media. Social shopping refers to consumers who use social media spaces to share coupons, reviews, purchases and more in order to help with their own and others’ future retail experiences. Recent apps such as Like2Buy combine the huge popularity of social media with a purchase platform. Like2Buy is now incorporated with many companies’ Instagram accounts which allows users to click on a picture that they like which will take them immediately to the brand page for purchasing. With Instagram getting more than 75 million users daily, it could be a huge source of revenue. Getting a seamless transition from picture to buying is vital. Being on a social media site also allows consumers to see the popularity of the product. Instagram allows users to like pictures and seeing that a product is popular will go a long way for persuading a customer to buy. This quick link between picture and purchase shows the drive to create faster links and an easier experience for consumers. Social shoppers are notoriously impatient; slow websites and longwinded routes to purchase often means a higher probability that the customer will click off site and may in the future go elsewhere. A survey carried out by Compuware showed that social media shoppers are influenced greatly by the speed and efficiency of online retail platforms. Around a third of survey participants expect a retail website to load in two seconds when using tablets, 24% expected loading in one second and 13% expect loading in less than a second. Obviously there is quite a large dependency on how good of a signal there is but it also shows the fickle nature of social shoppers. These statistics show how important navigation of an online retail platform is. Allowing users to move easily and quickly throughout different areas of a site can go a long way to retail customers. 46% of customers are more likely to go to a competitor’s website if they have a bad experience on a website. Catering to the needs of social shoppers and boosting omnichannel retail strategies could really help to boost retail sales. The majority of social shoppers are millennials between aged 18-24; this generation of consumers have grown up with the internet and expect more now from online retail. With the wealth of information available, online retailers should use this to their advantage and put social shopping as a priority for the future of their omnichannel retail strategies.